Sadie as a Buzzing Bee! Congratulations to Sadie – NJ Pet Sitters Pet of the Month for October 2010! 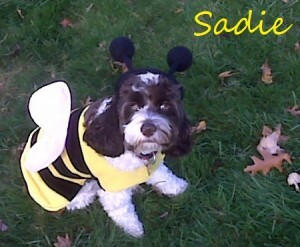 Sadie was a little buzzing bee for Halloween and looked adorable! She is happy go-lucky, very lovable and always sits in our laps and loves to give kisses. She loves to sniff around everywhere on her dog walks!